Welcome to a new edition of #FridayFinds, our weekly HR & Employee Engagement round-up with the best and most talked-about articles. Over the course of our many articles on happiness at work, we’ve shown how research suggests that people thrive in positive and supportive spaces. Employees that are happy and satisfied are also motivated and optimistic, setting higher goals and working harder and longer. This, in turn, leads to increased creativity, a lower chance of burnout and increased retention. 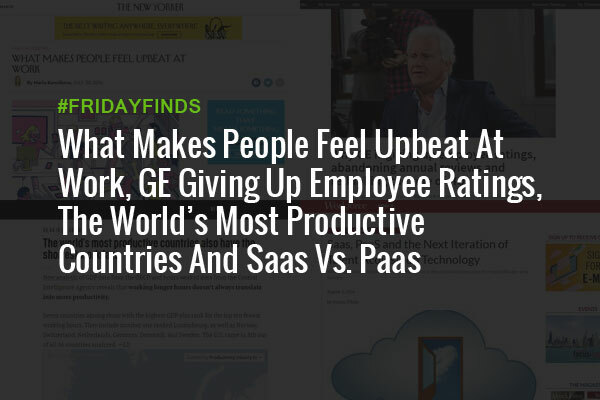 But what happens when you try to create a positive workplace by mandating it? Jeff Immelt, Chairman and CEO at GE, recently gave an interview talking about why and how GE is embracing decentralization and the use technology to help employees stay connected and allow more automated decision-making. New research shows that working longer hours doesn’t always translate into more productivity. I guess we were spot on with the fall of the 40-Hour work week prediction. It seems that seven countries among those with the highest GDP also rank for the top ten fewest working hours. They include number one ranked Luxembourg, as well as Norway, Switzerland, Netherlands, Germany, Denmark, and Sweden. The U.S. came in 8th out of all 36 countries analyzed. The article offers an in-depth overview of SaaS, as the new go-to for technology, but also at the next big thing, PaaS — Platform-as-a-Service. It seems that, while SaaS allows companies to more easily manage necessary computing resources like networks and servers, PaaS allows more tools to be brought to market quickly, helping to simplify the actual coding and deployment of applications. Join us next week as we share more of our favorite articles. We’d also love to know what articles made your week and what topics you’d like us to talk about next week so we look forward to reading your comments below!